When it comes to storing and displaying standard sized ATCs I use 7 Gypsies ATC carousels but for larger pieces I use two different storage/display systems. One I purchased and one I made. The one I purchased is a carousel system from Clip It Up. You can purchase the system with one or two tiers. The bottom tier is taller than the top tier. 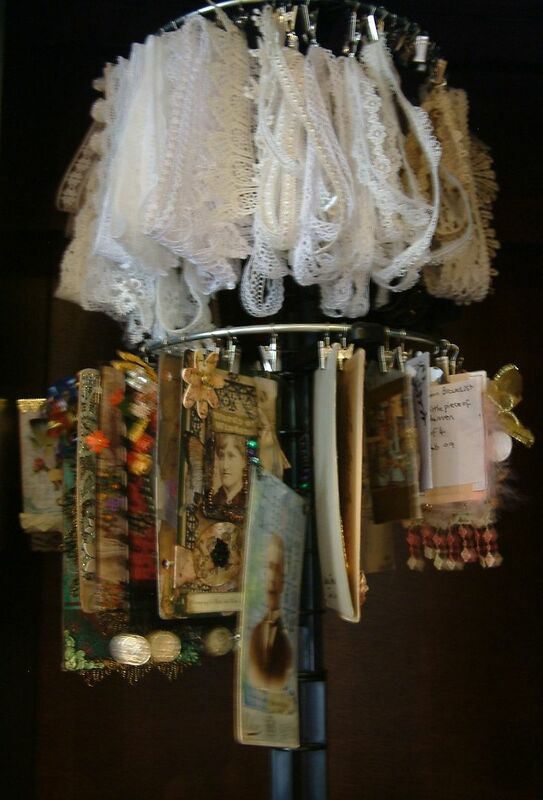 I use the top tier to store my lace and the bottom tier to hang altered cabinet cards, altered postcards and oversized ATCs. The clips that come with the product make it easy to add and remove pieces of art. Here is a picture of my Clip It Up carousel. The top tier gives you 9 ½” hanging room (height) and the bottom tier gives you 15” hanging room (height). 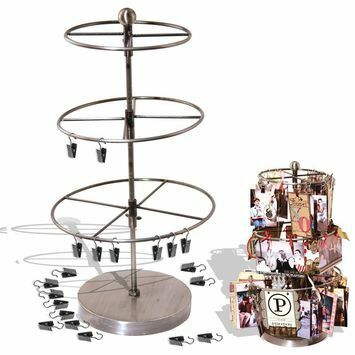 If you don’t want to use the clips that come with the system or there isn’t a good place to attach the clip, then add a small jump ring to the back of the piece and use ribbon to tie the piece to the carousel. 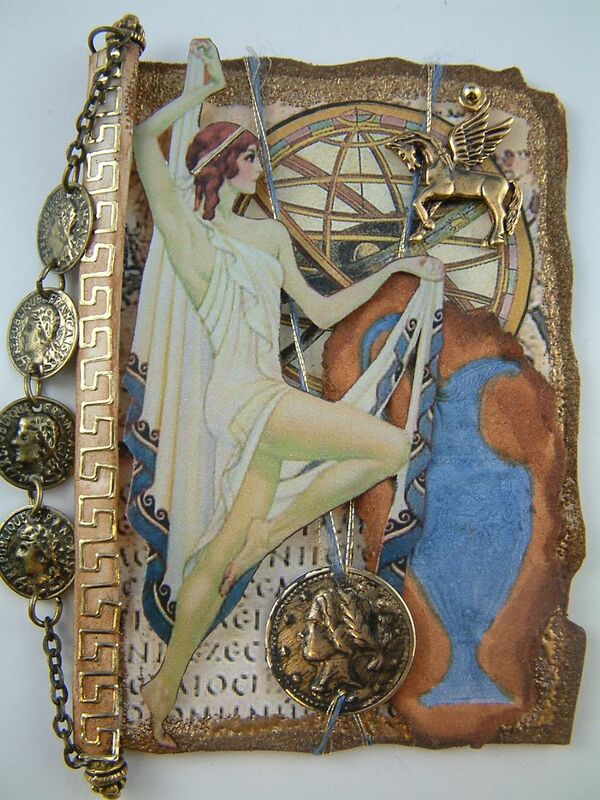 Tip from Sheree Rose - I also use the Clip it Up carousel for my Altered Cabinet Cards but didn't want to have the clips damage the art work. I found packs of plastic bags at Michaels which I use to store the Cab cards and the clip only goes on the plastic. You can find the Clip It Up system in scrapbook stores, online stores or buy directly from the manufacturer at http://www.clipitup.com/store/. In addition to the carousel they sell other storage and display systems. The second method I use for storage and display is Velcro. 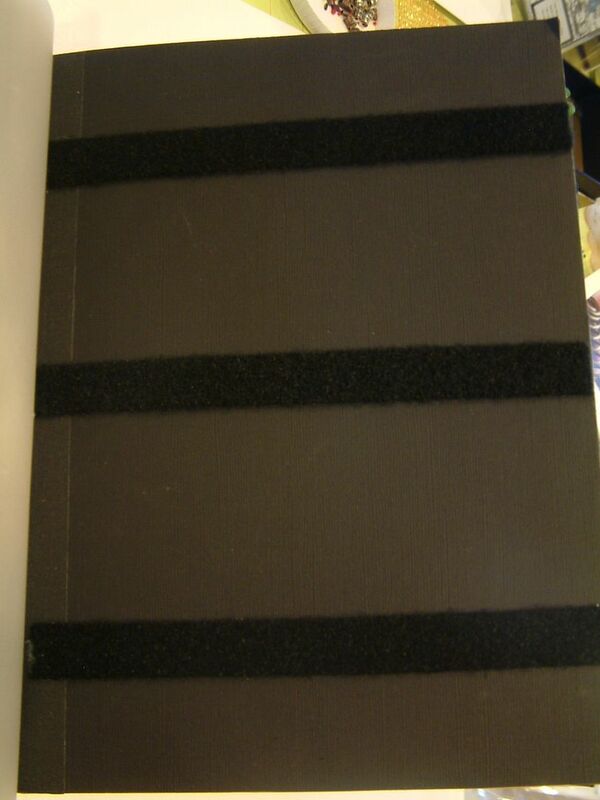 First I made a post bound album. For pages, I covered pieces of light weight chipboard with cardstock then attached strips of Velcro (the loop side) to each page (back and front). 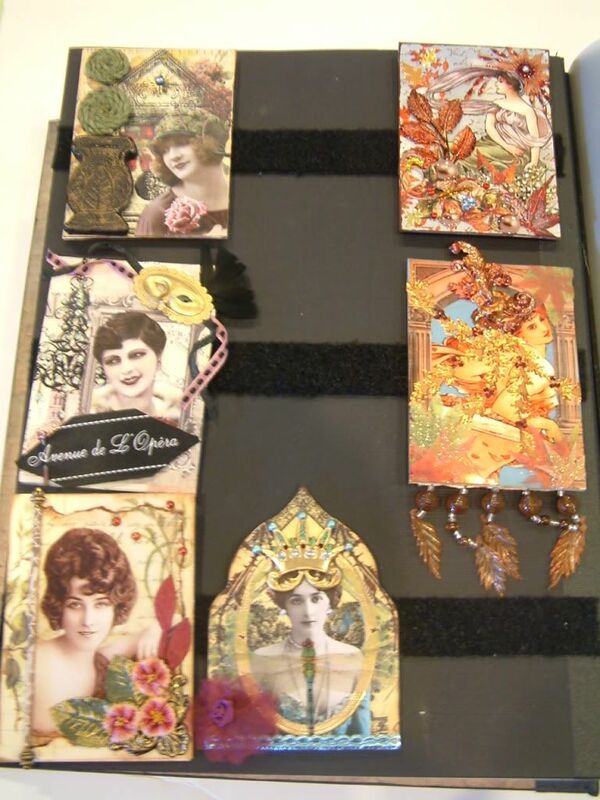 The purpose of using chipboard is to create a stiff and sturdy page that will support the weight of the cards. I punched holes in the pages to match the spacing of my album. To mount cards to the page I attach a tiny piece of Velcro (the hook side) to the back of the card. Now I can mount the card on the page. 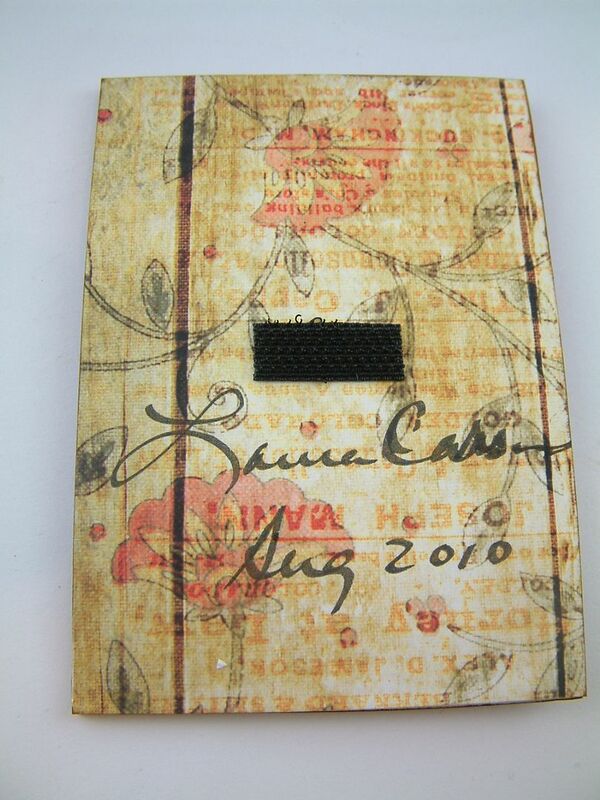 Using Velcro makes it easy to add, remove or reposition the art. To keep the art on opposing sheets from rubbing together I added a sheet of vellum between each set of pages. You don’t need to make your own album. 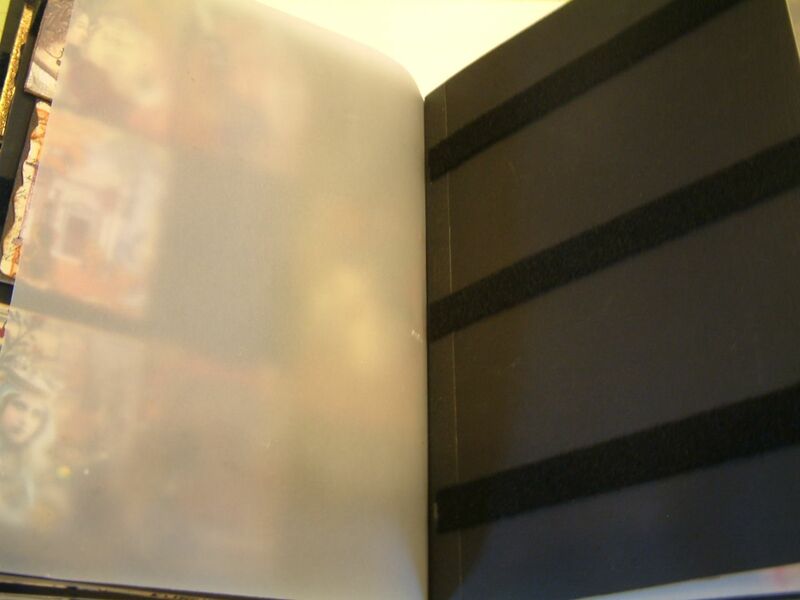 You could use a scrapbook album or a three ring binder. I actually like storing even regular sized ATCs this way as you can see and touch the art without the plastic getting in the way. If at some point you want to remove the piece of Velcro from the back of the art you can use Un-Du which dissolves glue without harming paper, photos, embellishments etc. You can find Un-Du at many craft stores, scrapbooking stores and hardware stores. You can also buy it directly from the manufacturer at https://un-du.com/index.php?option=com_wrapper&view=wrapper&Itemid=53. They don’t ship out of the US but I’m betting other countries carry a similar product. 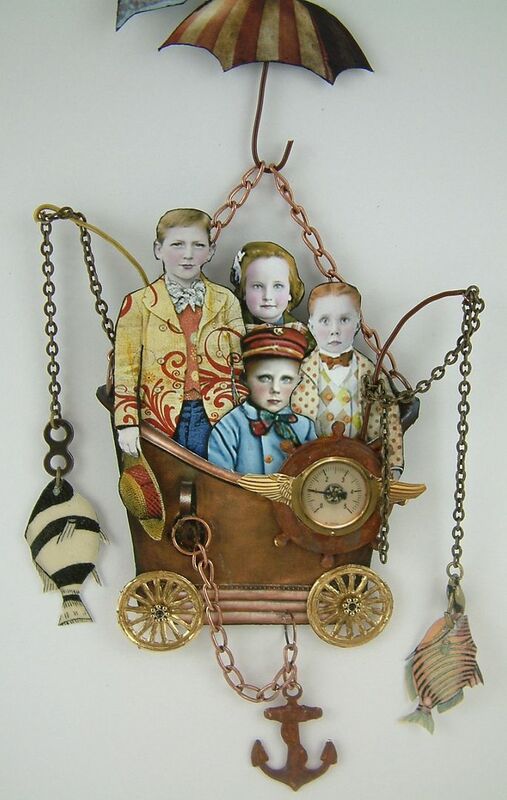 The name of this piece is inspired by the A-ha song “Living a Boy’s Adventure Tale” (I’m a big fan). It is also my “nod” to the Land of Nod Studios blog. The images of the boys are ones where Deborah colorized black and white photos and offered them as part of her Free Photo Fridays. 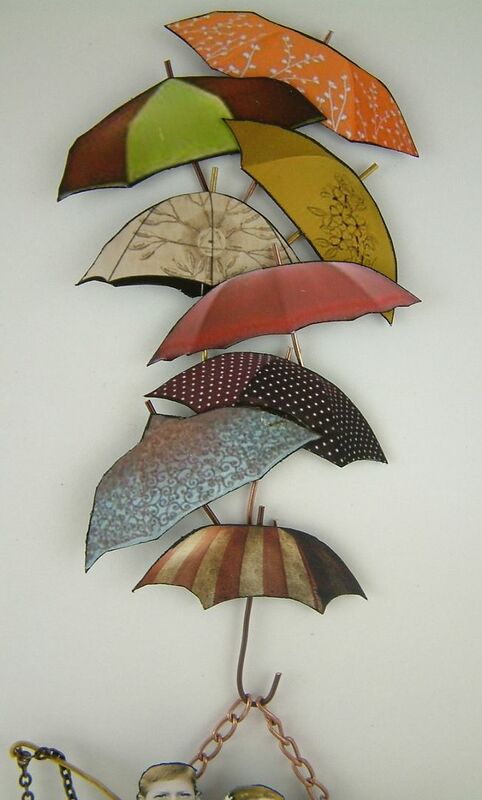 The boys have created a flying machine from a copper bathtub and umbrellas. I rusted the brass ships wheel and anchor. Later this week I’ll be posting a tutorial on rusting. This card is for a swap in the Creative Souls Group. 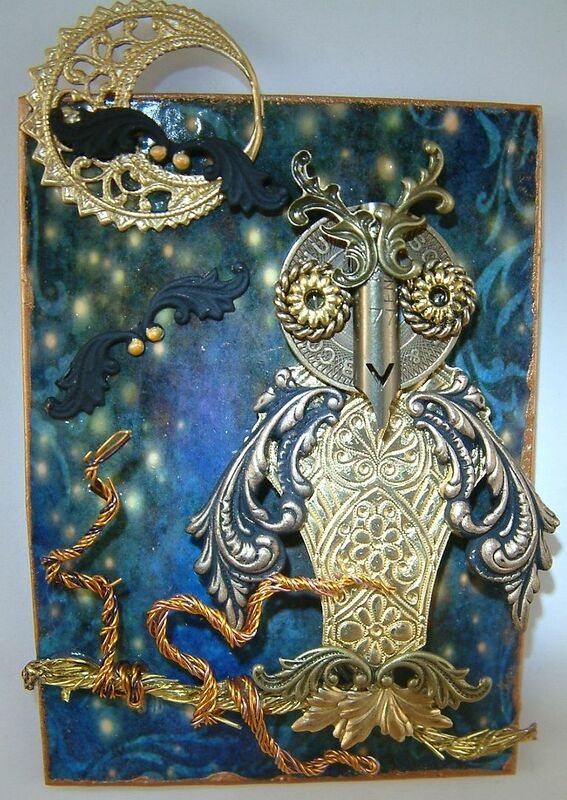 Everything on the card (owl, moon, bats) except the background is metal. 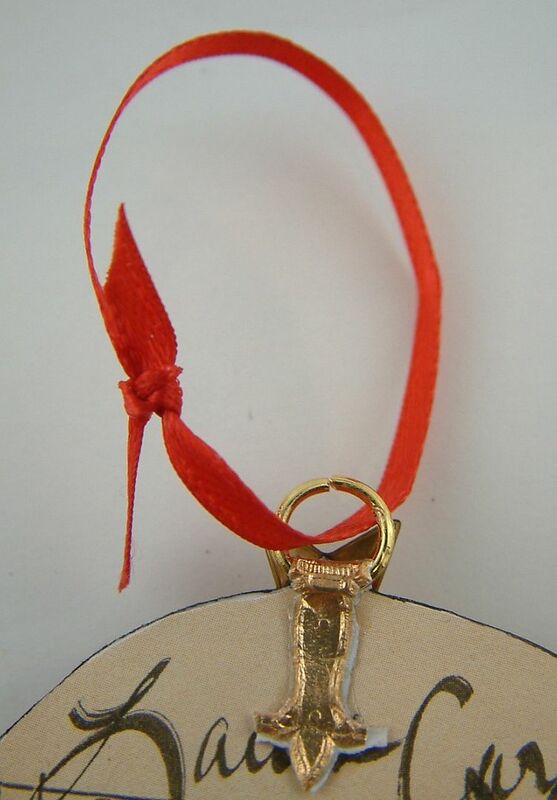 The branches are made of twisted wire, the head is an old subway token and the beak is a pen nib. 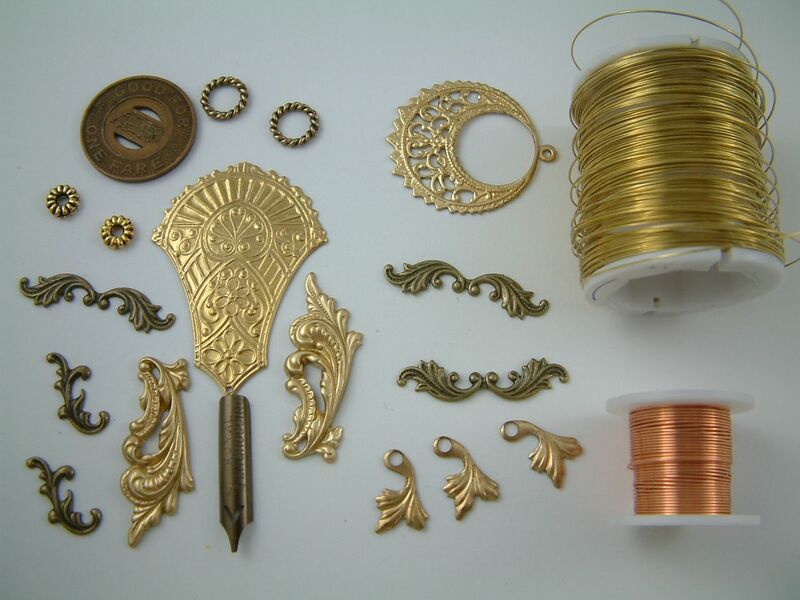 Below is a picture of all the bits and pieces I used. I made extra so I will probably offer one of these cards in next months (May’s) drawing. The pot is paper clay that has been stamped, painted and inked. Click here to see a tutorial on stamping paper clay. 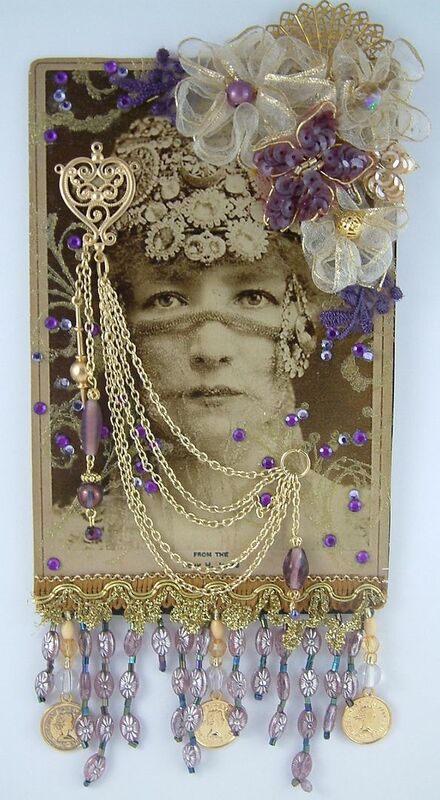 This is a altered cabinet card that I made for one of the creative team members (Julia Craighead). As a group we've been doing a couple of rounds of trading altered cards.